The Unix philosophy, originated by Ken Thompson, is a set of cultural norms and philosophical approaches to minimalist, modular software development. It is based on the experience of leading developers of the Unix operating system. Early Unix developers were important in bringing the concepts of modularity and reusability into software engineering practice, spawning a "software tools" movement. Over time, the leading developers of Unix (and programs that ran on it) established a set of cultural norms for developing software, norms which became as important and influential as the technology of Unix itself; this has been termed the "Unix philosophy." The Unix philosophy emphasizes building simple, short, clear, modular, and extensible code that can be easily maintained and repurposed by developers other than its creators. The Unix philosophy favors composability as opposed to monolithic design. Make each program do one thing well. To do a new job, build afresh rather than complicate old programs by adding new "features". Interactive use instead of batch processing. Economy and elegance of design due to size constraints ("salvation through suffering"). Self-supporting system: all Unix software is maintained under Unix. The whole philosophy of UNIX seems to stay out of assembler. Even though the UNIX system introduces a number of innovative programs and techniques, no single program or idea makes it work well. Instead, what makes it effective is the approach to programming, a philosophy of using the computer. Although that philosophy can't be written down in a single sentence, at its heart is the idea that the power of a system comes more from the relationships among programs than from the programs themselves. Many UNIX programs do quite trivial things in isolation, but, combined with other programs, become general and useful tools. The authors further write that their goal for this book is "to communicate the UNIX programming philosophy." The authors contrast Unix tools such as cat, with larger program suites used by other systems. The design of cat is typical of most UNIX programs: it implements one simple but general function that can be used in many different applications (including many not envisioned by the original author). Other commands are used for other functions. For example, there are separate commands for file system tasks like renaming files, deleting them, or telling how big they are. Other systems instead lump these into a single "file system" command with an internal structure and command language of its own. (The PIP file copy program found on operating systems like CP/M or RSX-11 is an example.) That approach is not necessarily worse or better, but it is certainly against the UNIX philosophy. The notion of "intricate and beautiful complexities" is almost an oxymoron. Unix programmers vie with each other for "simple and beautiful" honors — a point that's implicit in these rules, but is well worth making overt. Everything was small... and my heart sinks for Linux when I see the size of it. [...] The manual page, which really used to be a manual page, is now a small volume, with a thousand options... We used to sit around in the Unix Room saying, 'What can we throw out? Why is there this option?' It's often because there is some deficiency in the basic design — you didn't really hit the right design point. Instead of adding an option, think about what was forcing you to add that option. As stated by McIlroy, and generally accepted throughout the Unix community, Unix programs have always been expected to follow the concept of DOTADIW, or "Do One Thing and Do It Well." There are limited sources for the acronym DOTADIW on the Internet, but it is discussed at length during the development and packaging of new operating systems, especially in the Linux community. Patrick Volkerding, the project lead of Slackware Linux, invoked this design principle in a criticism of the systemd architecture, stating that, "attempting to control services, sockets, devices, mounts, etc., all within one daemon flies in the face of the UNIX concept of doing one thing and doing it well." Make the program and protocols extensible. Richard P. Gabriel suggests that a key advantage of Unix was that it embodied a design philosophy he termed "worse is better", in which simplicity of both the interface and the implementation are more important than any other attributes of the system—including correctness, consistency, and completeness. Gabriel argues that this design style has key evolutionary advantages, though he questions the quality of some results. For example, in the early days Unix used a monolithic kernel (which means that user processes carried out kernel system calls all on the user stack). If a signal was delivered to a process while it was blocked on a long-term I/O in the kernel, then what should be done? Should the signal be delayed, possibly for a long time (maybe indefinitely) while the I/O completed? The signal handler could not be executed when the process was in kernel mode, with sensitive kernel data on the stack. Should the kernel back-out the system call, and store it, for replay and restart later, assuming that the signal handler completes successfully? In these cases Ken Thompson and Dennis Ritchie favored simplicity over perfection. The Unix system would occasionally return early from a system call with an error stating that it had done nothing—the "Interrupted System Call", or an error number 4 (EINTR) in today's systems. Of course the call had been aborted in order to call the signal handler. This could only happen for a handful of long-running system calls such as read(), write(), open(), and select(). On the plus side, this made the I/O system many times simpler to design and understand. The vast majority of user programs were never affected because they did not handle or experience signals other than SIGINT and would die right away if one was raised. For the few other programs—things like shells or text editors that respond to job control key presses—small wrappers could be added to system calls so as to retry the call right away if this EINTR error was raised. Thus, the problem was solved in a simple manner. In a 1981 article entitled "The truth about Unix: The user interface is horrid" published in Datamation, Don Norman criticized the design philosophy of Unix for its lack of concern for the user interface. Writing from his background in cognitive science and from the perspective of the then-current philosophy of cognitive engineering, he focused on how end users comprehend and form a personal cognitive model of systems--or, in the case of Unix, fail to understand, with the result that disastrous mistakes (such as losing an hour's worth of work) are all too easy. ^ a b c d e Raymond, Eric S. (2003-09-23). "Basics of the Unix Philosophy". The Art of Unix Programming. Addison-Wesley Professional. ISBN 0-13-142901-9. Retrieved 2016-11-01. ^ a b "An Oral History of Unix". Princeton University History of Science. ^ a b Rob Pike; Brian W. Kernighan (October 1984). "Program Design in the UNIX Environment" (PDF). ^ Douglas McIlroy. 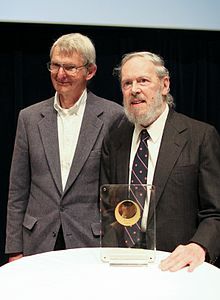 "Remarks for Japan Prize award ceremony for Dennis Ritchie, May 19, 2011, Murray Hill, NJ" (PDF). Retrieved 2014-06-19. ^ Bill McGonigle. "Ancestry of Linux — How the Fun Began (2005)". Retrieved 2014-06-19. ^ "Interview with Patrick Volkerding of Slackware". linuxquestions.org. 2012-06-07. Retrieved 2015-10-24. ^ Raymond, Eric (2003-09-19). The Art of Unix Programming. Addison-Wesley. ISBN 0-13-142901-9. Retrieved 2009-02-09. ^ Raymond, Eric (2003-09-19). "The Unix Philosophy in One Lesson". The Art of Unix Programming. Addison-Wesley. ISBN 0-13-142901-9. Retrieved 2009-02-09. ^ Norman, Don (1981). "The truth about Unix: The user interface is horrid" (PDF). Datamation (27(12)). Program Design in the UNIX Environment – The paper by Pike and Kernighan that preceded the book. Final Report of the Multics Kernel Design Project by M. D. Schroeder, D. D. Clark, J. H. Saltzer, and D. H. Wells, 1977. This page was last edited on 15 April 2019, at 11:46 (UTC).